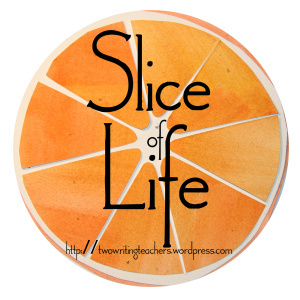 A Slice of Life, It’s Not Easy! “This is stupid! When will I ever need this in life?” She asks. It’s hard to push back your own memories of hating. math. class. the inspiration you wish you could be. with new teachers, new classes, new expectations. when it’s time to ask for help. What are you celebrating? As my kids make a mess of slime in the kitchen that was already full of dirty dishes, I’m celebrating this messy job of parenting. . .
One of my sons might drive you crazy painting white out onto a table, and needing 3 reminders to stop. He’s also the one who will help you move tables and chairs without being asked. He’ll enjoy the jolly rancher you give him to say thank you, and he will also ask “Why are they trying to bribe us with tickets and treats?” after he hears about the positive behavior system. He definitely benefits from authentic positive feedback, and the he is impassioned about the ridiculousness of positive behavior incentives. My daughter cares so much about animals, she won’t read a book or watch a movie that might have an animal go through a hardship… and she sighs loudly and rolls her eyes when I remind her to take the dog out. She sits for hours creating beautiful clay jewelry, a highly detailed sketch, and batches of slime. She also doesn’t understand why she has to go to school, and learn to study better. She is a creative writer, wants to write a book, and hates to sit and read. She reminds me to be stricter with her brothers a minute or two before she whacks them with the end of the dog’s leash. My youngest reads voraciously once he starts, asks me to order him books, spouts off facts he’s learned from his books, and complains when I ask him to do his 20 minutes of reading. He talks about not having new friends in his new school and a minute later tells me a funny story about the kids he was playing with at recess, or that 2 of his friends will be going to math with him. He tells on his brother, and then (of course) turns around and mimics whatever his brother just did. Isn’t it funny how everyone is different? Isn’t it amazing? Even within ourselves we are different — full of paradoxes. How can I figure out my children? How can I help them grow while I celebrate who they are?